Australia has introduced its highly controversial carbon tax, after years of bitter political wrangling. The law forces about 300 of the worst-polluting firms to pay a A$23 (£15; $24) levy for every tonne of greenhouse gases they produce. The government says the tax is needed to meet climate-change obligations of Australia - the highest emitter per-head in the developed world. But the opposition calls it a "toxic tax" that will cost jobs. The opposition also argues that the tax will raise the cost of living, promising to repeal the legislation if it wins the next election, due in 2013. Environmentalists have broadly backed the scheme, but there have been large public protests against it. Australia's mining firms, airlines, steel makers and energy firms are among those expected to be hardest hit by the the Clean Energy Act. Domestic fuel bills are expected to rise as companies pass on the costs to consumers. But the Labor government of Prime Minister Julia Gillard says it is the only realistic way of meeting Australia's climate-change obligations. It says the that low income earners will be compensated. "People have already seen pension increases and family payment increases and this assistance to families around the country will continue," Ms Gillard told Australia's ABC. 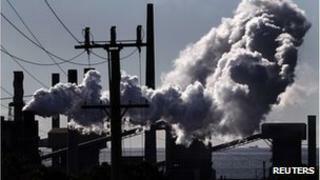 "Businesses have got themselves ready for carbon pricing. New investments are being made." The government also hopes that the legislation will force innovation in renewable energy supplies, and free the country from its reliance on fossil fuels. Australia currently accounts for 1.5% of the world's emissions, but it is the developed world's highest emitter per head of population thanks to its relatively small population. The leader of the opposition, Tony Abbott, says the "toxic" tax is expensive and unnecessary. He told his Liberal Party's conference on Saturday that Australian could be "100% certain" that there would be no carbon tax if he got elected. He added that the new tax "will raise every family's cost of living, it will make every job less secure but it won't help the environment". Australia's initial price per tonne of carbon is much higher than other similar schemes - such as in the EU where the price is between $8.7 and $12.6 a tonne.